Taking tests is a practical life skill, required for college entrance as well as many professions. Doctors, lawyers, teachers, contractors, nurses, and cosmetologists (to name just a few) all must take tests in order to enter their professions. Standardized testing in school provides a valuable opportunity to practice taking tests in a low-stakes environment, better preparing our students for future assessments – which is why we encourage all students to participate. Please do everything possible to make sure your student is at school on these days and that they come well rested and with healthy food in their bodies. Speaking of food, we have had a parent volunteer to provide breakfast for our class on May 2nd before our Math test! If you would like to help with the breakfast, please contact Christopher Garcia at photodogman@yahoo.com. I’m really excited about this! All of the Upper Elementary classes in our school are coming together to hold a Model United Nations in May. 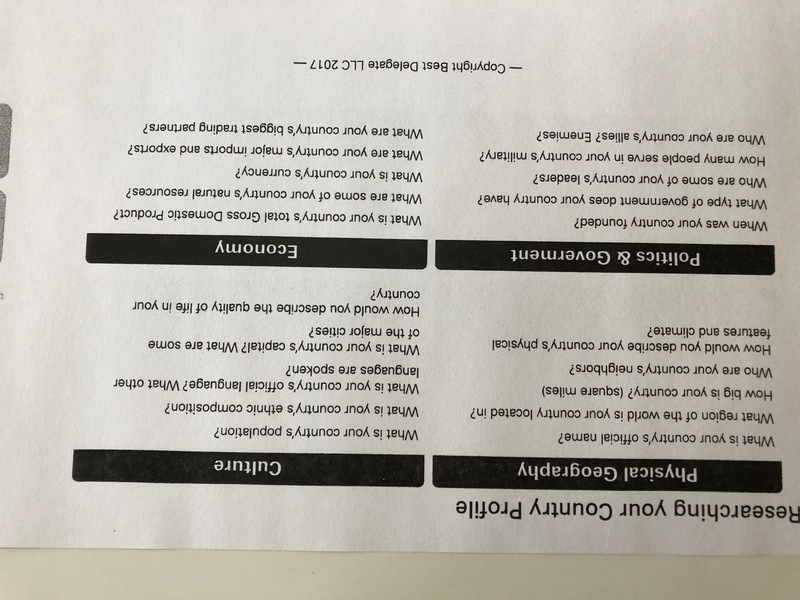 This is an exciting opportunity for the students to learn more about other countries around the world and the struggles and problems that they face. More importantly, it is an opportunity for the students to contemplate these struggles and work to find solutions. Our class will be representing six different nations in the Model UN. 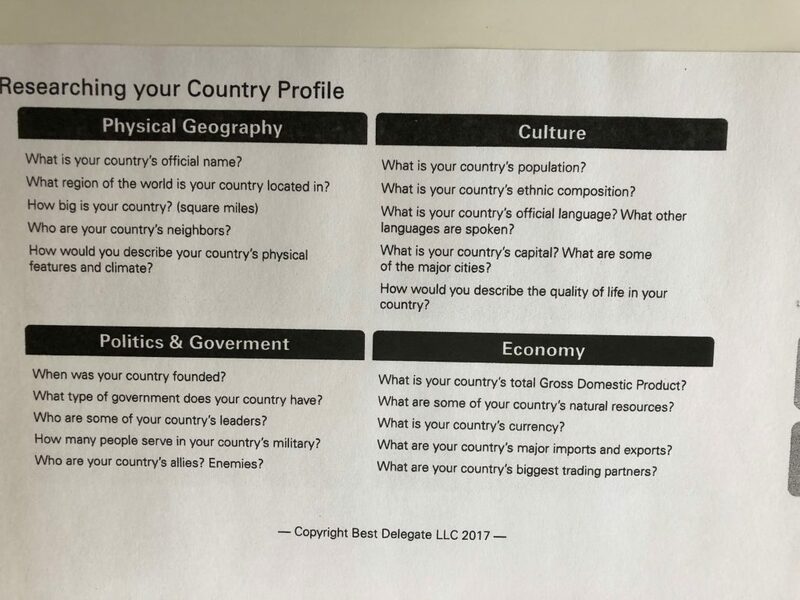 Each student has been assigned to research one of these countries to get some background information before we delve more into the problem solving aspect of this experience. We have started doing this research in class, but the students will need to spend some time completing their research at home. I would like to have the research completed and all of the questions answered by no later than April 12th. Thank you so much for your support! Federative Republic of Brazil: Amira, Ariane, Sienna, Tahlin, Gabe R.
This week is Literacy Week! I have always loved reading and look forward to focusing on literacy this week. I hope to get the students excited about reading and sharing some of their favorite books. A beautiful tree has been put up on the wall in the front of the school. Each time a student reads a book, they get to add a leaf to the tree. Please encourage your children to spend time at home reading good books! We want our tree to sprout a lot of leaves! This doesn’t have anything to do with Literacy Week, but Thursday is March 14th, which is Pi Day! We have already started preparing by learning about circles. The students look forward to this day every year because it means we get to eat pie! If any of you are willing and able, we would be happy to accept donations of a variety of pies on Thursday. Friday we will have a read-a-thon from 10-11:00 AM. The students may bring a blanket and one stuffed animal to help them enjoy their reading time. They should also bring a book from home if we do not have a book in the classroom that they want to read. Please don’t forget to look over and sign your student’s reflection sheet and return it to school tomorrow. I really feel strongly that helping students learn to break down their expectations, make a plan, and follow it is vital to their success. These are life-long skills that will come into play in all areas of their lives. Your support is an important part of the process. We’ll keep working on it! I appreciate the opportunity to spend time with your children every day. We have our issues, and I am definitely not perfect, but it is wonderful to learn and grow together. I am constantly reflecting on how things are going and what I can improve within myself to help everyone have the best possible experience while we are at school. I always have things to work on! Despite my flaws, I love and appreciate your children and want to do everything I can to help them succeed and be happy. I know I can speak for Petra and say that she feels the same. I love the first day of March! To me it brings hope that Winter will end and Spring will come. I look forward to seeing blue skies and feeling the warm sun again! We’ve had a busy and fun week here in our class. We had some fun Math lessons that got the students excited about Algebra. We learned about plants that changed the world in our Botany lesson with Ms. Rachael. We got to explore dinosaur bones and fossils with a fun kit from WSU. We also learned all about bones and got to see bones from lots of different animals. The students especially enjoyed this lesson and did not want to stop exploring all of the fun books about animals and the human skeleton. We studied the Boston Massacre and the Boston Tea Party and started preparing for mock trials concerning those two events. We had the spelling bee on Tuesday and I’m so proud of our students who worked hard and overcame their fears to represent our class. They did a great job! We also had the 6th grade STARBASE graduation. Our 6th graders had a great experience at STARBASE and learned so much. I’m excited for our students who will have the opportunity to attend next year. Please check with your students today to see their expectation sheets and reflections. These need to be signed and brought back to school on Monday. Due to the fact that we had a few extra things happening this week, many of the students did not get everything signed off that is usually required during the week. When filling out their reflections, I asked them to consider whether or not they used their time wisely and if they did the best that they could with the time that they were given. Some students are struggling to make an appropriate work plan and then follow it. We will keep practicing and reinforcing these skills. Thank you to those of you who have been bringing snack for our class! Mason is signed up to bring snack next week. Literacy Week is coming up the week of March 11th. As part of Literacy Week, we are asking every student to bring a picture of the cover of their favorite book. We will line the halls with the book covers and hope that it inspires students to explore some new books! Also, we are doing the book swap tables again this year. There will be tables set up in both kivas where students can swap out a book that they no longer want for something new. 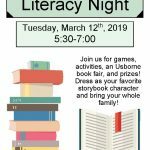 Literacy Night will be on Tuesday, March 12th from 5:30-7:00 PM. 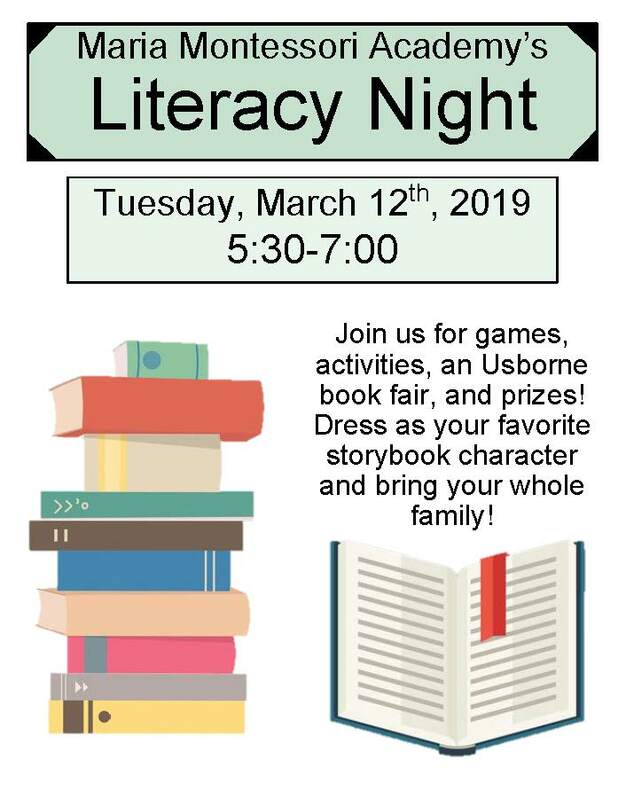 Come dressed as your favorite book character and enjoy a fun night with your family! Hello! I hope that you have all had a wonderful weekend and are ready for a great week ahead! Here are some things that you should be aware of. First, I want to thank all of the parents who came to Parent Teacher Conferences. It was wonderful to meet with you and talk about all of the things your students have been learning. I know the students were excited to show you the portfolios that they worked so hard to put together for you. I apologize to those of you who had to wait for me as I got a little behind schedule at times and I appreciate your patience. If you were unable to attend conferences and would still like to come in, please e-mail me at kgonzales@mariamontessoriacademy.org. Last week we really emphasized using the expectation sheets to plan and complete work in class. We discussed it at length every day and gave the students many reminders. I was really proud of many students who made great work choices and met the work expectations for the week. Some students still struggled to be productive and fell short of meeting expectations. Please be sure to find, read, and sign the pink reflection sheets that went home on Friday. Discuss them with your students. Encourage your students to put their best foot forward at school and put forth the necessary effort to be successful. Please let Petra and I know if there is anything we can do to help your child meet expectations. The reflection sheets should be returned with a parent signature tomorrow. We will be doing extra history lessons and projects at school this week in honor of History Week. We have been able to borrow some fun materials from Weber State about dinosaurs and bones that I am excited to share with the students. We will be discussing the theme of Tragedy and Triumph as it applies to various historical events and people. The Spelling Bee will be held this Tuesday at 11:00 AM in the addition gym. We are so proud of the students who will be representing our class and wish them the best of luck! Parents are invited and encouraged to attend. Last week we had a student wear a very nice watch to school and it went missing when he took it off briefly in the classroom. Please be on the lookout for an unfamiliar watch that might appear in your home. Thank you for sharing your children with us. Petra and I love them! We will be exchanging valentines on Thursday for Valentine’s Day. We have 31 students in our class, so please plan to bring enough valentines for everyone if you choose to bring some (passing out valentines is optional). We will not be making boxes or bags in class, but feel free to make one at home and bring it on Thursday. You may pass out candy with your valentines, but the candy can not be eaten at school. It will need to remain packaged and be eaten at home. Some people have requested a class list so that they can address the valentines. Here it is! Wednesday, January 16th is the science fair. All 6th graders should bring their projects this day and have them displayed at 8:30 AM. They must have a research paper and a lab book to accompany their display board. They may bring a book or quiet game to occupy themselves while they wait for their turn to be judged. Parents are invited to come and view the projects from 2:30-4:00 PM. Thursday, January 17th the 4th graders will be displaying their STEM projects that we have been working on in class. We have been learning about earthquakes and trying to build a 3 story building that will withstand a mild earthquake. Friday, January 18th is our 5th grade field trip to Biztown. Please have your child at North Shore by 7:20 AM. If they did not order a Chick Fil A lunch, they will need to pack a lunch. All students should bring a water bottle. If your child would like to purchase a Biztown T-shirt, which is dress code approved, they may bring $10 to purchase a shirt. Our drivers are Shaylee Larsen (Wyatt’s mom), Tammy Harr (Ashley’s grandma), and Felicia Fernandez (Sophia’s mom). Be looking for a track it forward link later tonight to sign your child up for a ride. There will also be lots of fun STEM assemblies and presentations for all of the students this week. I’m looking forward to it! SCREENAGERS – The average child in America spends more time consuming electronic media than going to school, with many teenagers going online “almost constantly.” In SCREENAGERS, physician and filmmaker Delaney takes a deeply personal approach as she probes into family life to explore parental struggles over social media, video games, academics and internet addiction. Through poignant and funny stories along with insights from authors, psychologists, and brain scientists, SCREENAGERS reveals how tech time impacts kids’ development and offers solutions on how adults can empower kids to best navigate the digital world and find balance. Our class has decided to have a holiday feast on December 20th at 12:00 PM! Each student may invite two guests to join them. We’d love to have you join us! Please sign up here: https://www.trackitforward.com/site/389525/event/447616 if you can help provide things for the feast. If you sign up to bring food, it would be helpful if you could provide your own serving utensils. Thanks! We want to thank everyone who came and participated in Parent Teacher Conferences earlier this month. It was wonderful meeting with all of you and discussing the progress your children have been making. We have wonderful students and families in our class and it is a pleasure working with all of you! Thank you, as well, to all of the parents who helped drive students to the Newsies field trip this week. We had a great time! Speaking of driving for field trips, we have our field trip to the Hogle Zoo this Wednesday! Please let us know ASAP if you can help drive students on this trip. We had a few parents sign up to help at conferences, but we could use a few more. We will send out the Track it Forward sheet for you to sign your child up for a carpool tomorrow. This past week was challenging. All of us were a bit out of sorts with the tragic loss of Molly and Troy Cox, two members of our MMA family. Petra and I did our best to support those students who were struggling and maintain a sense of normalcy for the students overall. We did have several of the students in our class spend some time with the grief counselors that were available at the school on Wednesday. We will continue to support the students and help them to process and understand their grief during this difficult time. Our next home project will be due on November 15th. This is the project about America that will be part of our school’s Cultural Festival. We decided to leave this project pretty open-ended. Students may choose to study anything about America that is of interest to them. Please let me know if your child needs help narrowing down their ideas. This project should be on a tri-fold board that can easily be displayed on a table top. We will not be distributing specific questions that need to be answered, as we anticipate the topics being quite varied. The display should be attractive and the topic well represented with information and pictures. Students should be able to present information on their topic to parents, teachers, and students who will be walking around to see the different displays. There are a couple things that our class will be working on that we’d love you to reinforce at home. Some of our students are struggling to be kind to others. We will be having some lessons to reinforce that our words and actions matter and that they affect those around us. Everyone deserves to be treated with respect, even those people that we may not like. Another thing that we will be working on is our noise level. We have a chatty class this year and it can make learning and focusing difficult. We will be practicing speaking with quieter voices and limiting our conversations during class time to things that pertain to our lessons and works. Reminders at home go a long way toward helping the students make better choices at school. Petra and I love your children and are grateful for the opportunity to work with them. Please let us know if you have any concerns or questions!